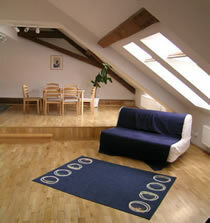 Well furnished apartments in an excellent central Prague location, in the middle of Wenceslas Square. Restaurants, shops, bars and clubs are just out the door. The stylish 3* Wenceslas Square Group Apartments are spacious and bright, and are set in a large modern building which overlooks the main square (Marks & Spencer is in the same building). Choose from studio, one, two and three-bedroom apartments. Apartments feature a choice of single or double beds. All come with lounge/dining areas, fully equipped kitchens and modern bathrooms with bath or shower. Facilities include: bed linen and towels, refrigerator, microwave, cooking utensils, kettle, crockery, cutlery, washing machine (most apartments), dishwasher (some apartments), Satellite LCD TV, safe and free Wi-Fi. A first-class health suite, open to all guests, is located in the apartment house. It offers a gym, sauna, steam room, solarium, massage and cosmetic treatments. Charges apply. The apartment house has a 24 hour reception desk and 24 hour security desk. Secure underground parking is available at 650 CZK per night. Advance reservation necessary. Marks & Spencer, which is below the apartments, has a food and wine section and a bakery. Desirred Department Store, which is opposite the apartments, has an Albert supermarket beneath it. And 5 minutes walk from Wenceslas Square is Tesco, the largest food store in the centre of Prague.